If you’ve ever walked into a business that looked dirty, you probably didn’t become a repeat customer. Lone Star Carpet Care and Restoration understands and respects the fact that customers expect a certain standard of cleanliness and professionalism from the businesses they patronize. After all, we’ve build our own company on those very principles. We know about pleasing customers! A dirty-looking restaurant is not going to be successful. Customers want to know that their food is being prepared in a clean environment, so every surface must be spotless. Most restaurants avoid carpet and upholstered furniture because dropped food and spilled drinks can stain them easily, and maybe even ruin them. Restaurants that brave these fabrics often do so to set themselves apart and to provide a cozy atmosphere to eat, drink and be merry. Unfortunately, they will at some time incur a stain that they can’t get out. 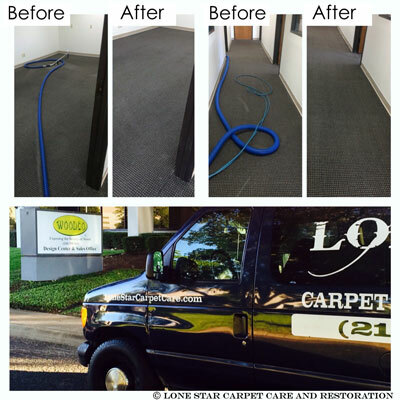 Rather than leaving it there for future customers to see, they call us, Lone Star Carpet Care and Restoration, for our comprehensive commercial carpet cleaning service. Cleanliness is of the utmost importance in hotels as well as restaurants. When multiple families are sleeping on the same beds, walking on the same carpets, and sitting in the same chairs, it’s important for their piece of mind to know that the lodging they have chosen takes the initiative to have those items deep cleaned regularly. Housekeeping can do a lot to clean away messes and germs on the surfaces of things. 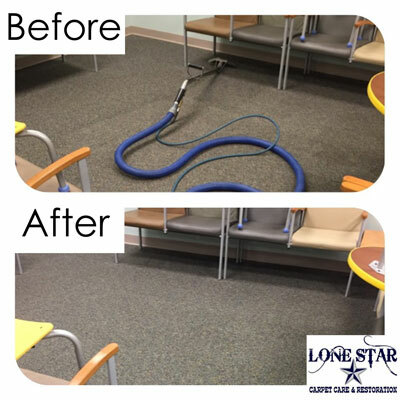 To get a deep clean, call Lone Star Carpet Care and Restoration regularly for commercial carpet cleaning! It’s a proven fact that employees are more productive when they have a clean environment to work in. Additionally, working in a germ-infested environment will cause employees to be sick more often and miss work more frequently. Lone Star Carpet Care and Restoration can provide commercial carpet cleaning that not only makes your office or store look and smell nice, but our services will also sanitize the area by removing germs and allergens buried in the carpet fibers. Most of the time, commercial jobs will require us to combine services. In all of the businesses above, it may be necessary for Lone Star Carpet Care and Restoration to also do tile and grout cleaning and upholstery cleaning along with commercial carpet cleaning. Occasionally, we also include air duct cleaning in a business’s individualized cleaning plan.